The US is ready to put forward its own plan to effectively fight terrorism in Syria and it is not going to cooperate with Russia on the issue, the Pentagon said in a statement. "US military officials believe there is a more effective way to do counterterrorism operations than major conventional operations in Idlib. 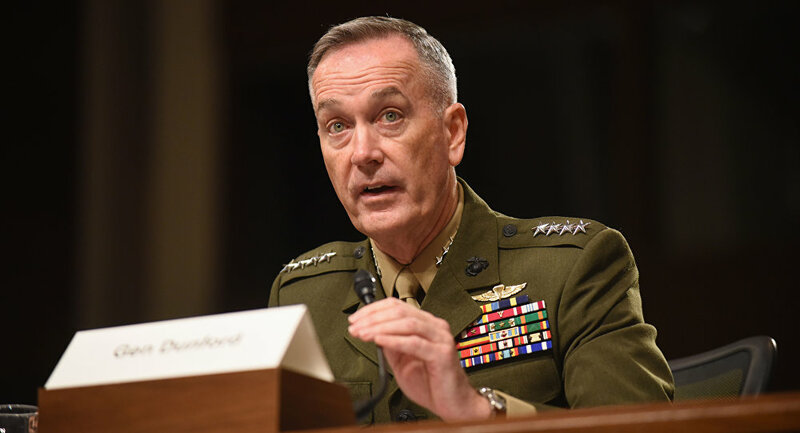 The chairman said the United States was not talking about cooperating, but about using US capabilities to spot the terrorists — even in an urban environment — and take them out with a minimum of civilian casualties," the US Department of Defense said, citing Gen. Joseph Dunford. According to Chairman of the US Joint Chiefs of Staff Gen. Joseph Dunford, he has not spoken with his Russian counterpart, Army General Valery Gerasimov, since the crisis in Idlib began and that he does not plan to communicate with him yet. The Pentagon spokesman has also reported that, according to estimates, about 20-30 thousand terrorists have entered Idlib to "hide among hundreds of thousands of people" who have fled violence in other areas of Syria. The province of Idlib is the last remaining stronghold of insurgency in the country and is also one of Syria's de-escalation zones. Syrian President Bashar Assad has earlier stressed that the liberation of the province was among the priorities for the Syrian military's operations.